Have you EVER had ideas for a new wyrm type? Well here's your chance to show them off and possibly get your ideas into the game. Any additional prizes will be announced when the chosen designs are opened up for voting. - You must provide some sort of visual for your new breed (you will not be judged on art skills). This sample will be considered breed standard so please try to be as accurate as you can on things like face shape, nostril shape, coloration, etc. Please keep your concepts to the common or uncommon for this new type. - You are creating a new breed. This means a new environment (so no jungle, mountain, etc. as they already exist.) You must provide up to two paragraphs (no more please) describing your breed's habitat, habits, and how they interact with their environment. Feel free to give some basic lore as well. Please also describe any necessary information such as new traits. - Please avoid existing CDF breeds. Feel free to use existing CDF markings (ex: BW, lace, frost, etc.) but please avoid making complex paint jobs or sculpts part of your breed standard. (ex: harlequin, fade). - You MAY use existing CDF traits (horns, plating, etc.) but please keep rarity in mind. Try to stick to common/uncommon traits. - You may enter up to TWO concepts. Please make a separate post for both concepts in order to keep them organized. - Try not to incorporate existing CDF breeds. This is not a breeding project. They should look unique, not like hybrids. HOW WILL YOU DECIDE A WINNER?! Well here's the beauty of it! We are placing this in your hands this Homecon. Staff will select 3-5 designs we feel are doable in terms of complexity, cross breeding, and in terms of traits brought into the game. Then YOU my fellow handlers will decide the rest. - Every participant gets 2 free votes to spread over their favorite choices. DM Shadra your choices. - Additional votes can be purchased via $1 donation to the convention's charity per additional vote. YOU MUST DM Shadra with proof of donation to receive votes. - You may only vote ONCE for your own concept per household. This includes purchased additional votes. WHAT HAPPENS if I win?! Well first of all CONGRATS. 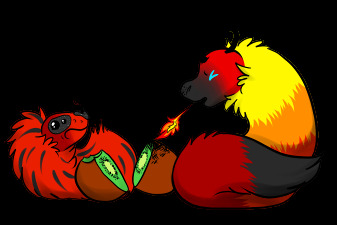 Your design is going to become an official wyrm breed, how awesome is that? Buuuut now we get into the nitty gritty of it. - CDF staff will work with the winner via private chat to finalize the design (small changes may be necessary to preserve structural integrity or make it work as a wyrm). This includes the alpha/omega traits. - The design will be folded into the lore of the CDF world. 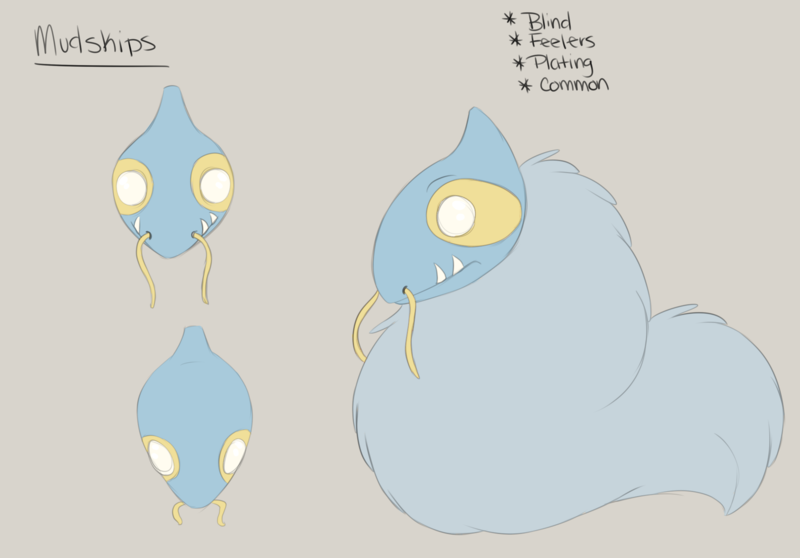 You provided the basics but CDF may provide additional fleshing out of the concept such as how they interact with other breeds/types, how they are affected by outside influences in the world (ex: toxic chemicals created the infected wyrms). - CDF has a copyright ownership of CDF's breed designs/names. By submitting designs to the contest you acknowledge and agree that if your design is chosen as the winner that you are providing exclusive, unlimited, and irrevocable rights to manufacture products based on this design. You agree that you are entitled to no additional compensation beyond winning the contest. Frostibou are peaceful herd creatures who roam the tundra in search of food. They typically graze on sparse grasses. They have a thick coat and a layer of fat beneath it in order to keep warm in the tundra environment. 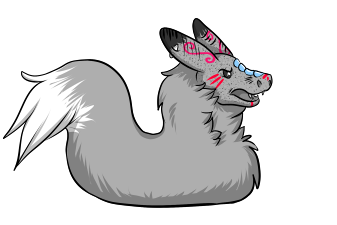 They are typically seen as a prey animal to other wyrms in the area. Genetically these guys have Benign White on their muzzles (usually in any horse-like markings) with a layer of glitter on top, transforming it into the trait known as Frost. This trait helps the Frostibou blend into the snow of the tundras and provides a glittering distraction against predators. Their horns are small nubs which may grow into antlers in larger Frostibou. Their genetic color is expressed through their cheek patches and may be any color. They may have colored bodies. A typical Frostibou is a neutral color with cool colored cheeks. 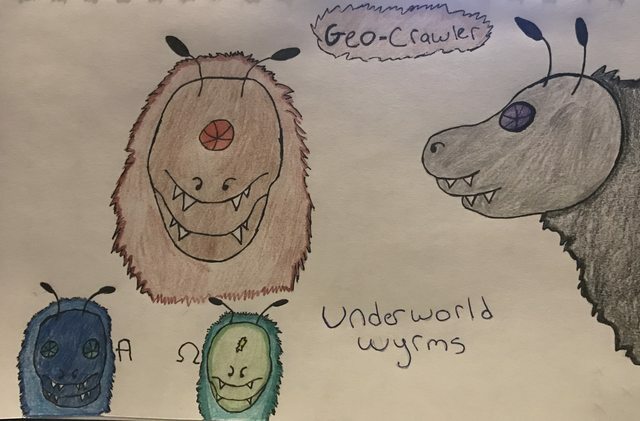 Geocrawlers are peaceful wyrms who spend most of their time underground. Due to being in the dark 90% of their lives the colors they come in are normally darker. They have evolved into having no eyes since its useless in a pitch black environment. They use feelers to move around and know where to go. Their diet mostly consist of bacteria in the dirt however they will also use their large double set of teeth to eat roots hidden underground. On the center of their head is a large crystal. The Crystal is given to them by the queen Geocrawler once they prove their maturity by finding a large meal to feed the hive. Normally it takes 2 to 3 years for them to reach maturity and be rewarded this gem. In the case that they fail this mission they get a shard instead of a full crystal. Typically given to what the hive considers an omega. Alphas are rewarded with two crystals, one on each side of the head and the location of where eyes would normally be. If the Geo crawler is successful enough to have a bountiful meal for the whole swarm they are rewarded with the alpha status. Only an alpha is allowed to breed with the queen as they show the highest chance to give a pure queen offspring. Shy creatures, Tortles live in small burrows they dig into trees or rocks near the water. Every male is particularly attentive to their burrow making it fancy with flowers and other colorful accouterments hoping to attract a female to share their nest. Although males do the courting, females are generally larger, more dominate, and often leave their mates to care for their eggs. They rarely stray more than a few feet from the water and subsist mostly on weedy vegetation growing near the swamp. They do, however, have a strong sweet tooth and those that have been domesticated have shown a particular fondness for extra ripe fruit. Tortles consider themselves custodians of the swamp and have a very strong affinity for tidying up the place by rearranging small rocks and trimming plants. They are purely vegetarian and especially enjoy sweet plants as well as the scent of nectar. They often protect the larva of various insects that come to the swamp to breed. When not caring for their habitat, Tortles can often be seen sunbathing, but if depressed they will retreat into their burrows and barely move for hours or even days at a time. Magma Munchers are aggressive and highly territorial. Their diet consists of Igneous rock and they will often drink lava (commonly swimming in it) because they love the warmth and it looks cool. As one would expect they do not tolerate cold well, be sure they have heat lamps if domesticated. They have a new trait, soot, from constant exposure to ash, seen as small patches of black scattered across the face (often present but not always). Usually they are genetically warm tones (red, orange, yellow, pink) with banding trait common. They have a single spine on the snout. These cave dwellers have developed a natural blindness due to living in almost complete darkness. They do sometimes venture to the edge of their caves but rarely stay long as they are extremely suspicious of any creatures living outside their home due to their blindness. They compensate for their lack of sight in a number of ways the most important of which is the feelers on their face which allow them to sense things in the dark as well as amplifying their sense of smell. They will also use their tails to navigate and feel what is around them in a manner that makes it appear as if they are skipping in shallow water. This behavior is what earned them their name. Mudskippers spend most of their time in the water and have small sharp teeth for catching fish and insects. These are not overly aggressive creatures, but they can be very territorial especially during mating season. Because they cannot see, they rely heavily on vocalization to communicate and as such make a wider array of sounds than most wyrm species. Mudskippers can come in any color but are generally a muted hue. They all have plating surrounding their eyes which often (but not always) matches the color of their feelers. The length of their feelers can be used to determine their age and those with the longest feelers are revered for their wisdom and skills. Named for their soft peeping noises and affinity for cacti, these gentle creatures belong to the desert breed of wyrms and thrive in dry climates. They burrow into succulents to survive the harsh conditions and often disguise themselves among the cactus flowers where they produce a sweet scent to attract insects for food. While their diet mainly consists of small bugs, prickly peepers love feeding on nectar and have developed long tongues to harvest it when the cactus is in bloom. They live in colonies which vary in size depending on how large the plant they inhabit is. These are fun-loving and social creatures that can often be heard singing at night in a manner very similar to tree frogs. Not known for their intelligence, Prickly Peepers spend most of their days playing and cultivating new plants to bring smaller colonies closer together. They love caring for all types of plants, and tending to them is pretty much the only form of work they will ever be seen doing. Their base color generally ranges from very pale to dark green and individual colonies can often be determined from their body hue. 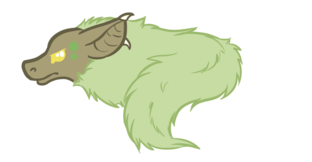 They display a mutation of the tuft gene turning into ear tufts (Te) which double as camouflage and a method for dispersing heat to stay cool. These feathers are always vibrantly colored to match the flowers that bloom on their homes and Peepers will often have dapple on their cheeks which usually matches the color of their tufts. The Picksnout is a gruff and somewhat surly wyrm typically found on cavern walls, where it nests in small family groups and searches for its preferred foods- various minerals and precious and semi-precious materials. Picksnouts are fond of a wide variety of elements found in their caves but are particularly partial to metallic sources, using their specialized snout horn to chisel away at the stone until they find an especially appealing vein or deposit. Given that they are blind as a species, Picksnouts locate these through a combination of an acute sense of smell and detection of extremely subtle vibrations in the rock while they’re mining. This also means they are highly tactile wyrms- they adore being picked up and stroked, making them very affectionate towards potential handlers. However, they are best not kept with Crystal wyrms- due to their excavation habits, Picksnouts frequently destroy crystal formations that support Crystal wyrm colonies, which has resulted in them being roundly hated by Crystal wyrms of all breeds. A Picksnout’s genetic colour is expressed through its plates. The horn should resemble a pick, slightly curved and pointed. The base body and head colour are greys or browns, similar to the stone colours found in their caves. Visible teeth are a common feature, with one or two pairs showing at a time. Picksnouts cannot show body colour. Typical Picksnout colouration is a light to dark brown or grey with genetic colours leaning to greens, blues and purples. A highly venomous and solitary predator, the Stinging Chilo dwells on cavern floors, just out of sight of cave entrances. They are a rather dangerous and voracious wyrm, searching for any and all potential prey in their environment via use of their antennae. While entirely blind as a breed, they do have a rudimentary ability to differentiate between light and dark, as well as heat-sensing. The Chilo takes down prey via a powerfully venomous bite delivered by their mandibles. 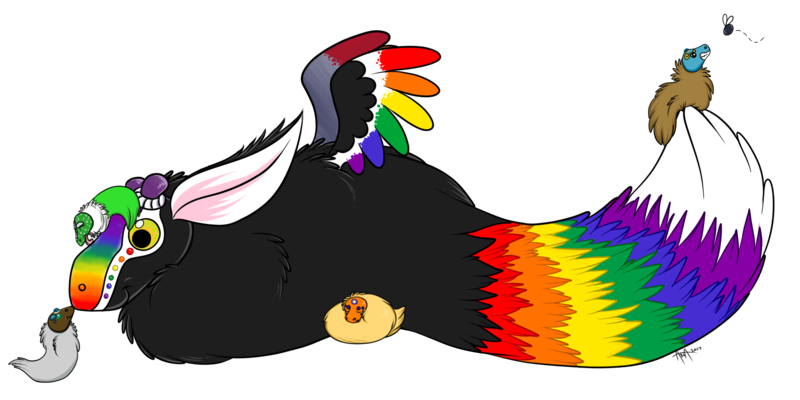 These make them surprisingly effective as hunters, which is necessitated by the particular kind of prey Chilos are typically after. They frequently predate on various Mountain wyrms that stray into their caves- it is not uncommon for Moss Hoarders, Tunnelers and even Growlers to become a meal for the Chilo. Especially aggressive or large Chilos may even hunt young Shriekers, although this is very rare- Shriekers are frequently not worth the trouble. The Chilo’s head is protected by a plate of chinitous armour (not a breedable trait). Because they are venomous they have warning colouration- bright reds, oranges, yellows, sometimes contrasted with other colours. Genetic colour is shown on entire body of wyrm- the colour on the head can sometimes contrast the fur colour. Antennae are always located on the end of the snout. Most common secondary trait seen is Ink Spot. Mandibles are always black.